Re-construct awe-inspiring structures for a whole new generation in Rebuild the History, a fantastic endeavor to restore historical buildings. During past centuries, natural disasters, wars, and other calamities have all but destroyed many of the magnificent structures created by man's thirst for beauty, ingenuity, and functionality. Now that peace and calm have returned, you've been tasked with rebuilding some of these beautiful creations so that the new generation of people can learn to appreciate them once again. 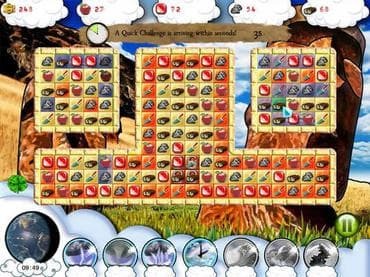 Rebuild these treasures of the world in 120 wonderful levels of Match 3 enjoyment. Gather resources and construct the Eiffel Tower, the Taj Mahal, and other historic buildings. Use money earned to purchase helpful power-ups that allow you to collect even more resources at a time. While you're at it, you can also learn many fascinating facts on the structures. Download free full version game today and start playing today! Free Game Features: - Restore magnificent structures torn asunder in this entertaining Match 3 challenge; - Play 120 levels to collect resources for your endeavor; - Reconstruct the Eiffel Tower, the Taj Mahal, and more structures around the world; - Use money earned to purchase helpful power-ups; - Learn many fascinating facts on the structures. If you have questions about Rebuild the History game, please contact us using this form.